The film noir movies of the 1940s and ‘50s created fashionable Hollywood crime dramas out of the dark attitudes and plots deriving from the unsentimental crime fictions that emerged during the great depression. In the simplicity of the low-key black and white film, immense drama was created that complemented the dark attitudes of the storylines. Yet these movies would be nothing without the charismatic silver screen sirens starring as the femme fatale. There is something captivating about the women who graced the silver screens 1940’s and 50s. This was an era where Hollywood was at its most glamorous, with Hollywood bombshells wearing fierce winged eyeliner, perfectly set hair and gorgeous gowns. What could be more glamourous? Even with cynical plots of the film noir style movies that emerged from the period, still to today we are mesmerised by the femme fatales played by Rita Hayworth and Ava Gardner. So why not re-create this glamorous time? Therefore, with Christmas approaching, I thought it would be a great idea to hold a special themed photo shoot day in my studio and transform other women into silver screen sirens. Why spend the day on your feet pushing through crowds in busy shopping centres, searching high and low for the perfect gift for that special someone, then have to wait an eternity in a long line to pay for it? Why not instead indulge in a day of pampering for yourself in a fun, relaxing atmosphere and then have some special photos to give to that special someone as the perfect Christmas gift? I’m sure every mother or father cannot get enough photos of their daughter, or at least mine. Or what partner would not cherish precious photographs of you, all dolled up like a glamour goddess for many years to come, as you grow old together? Definitely none in their right mind. Therefore, I got together with the gorgeous Loretta Lowbrow, Gemma Sheree from GSL Makeup and Christine’s to contrive an exciting event, which will be held at my Mornington Peninsula studio on the 7th of December, which is THIS SUNDAY! As always, will be pampering the ladies that come to our studio with complementary champagne, a silver tea/coffee service and nibblies. These ladies will then be transformed into a silver screen siren, with a complete vintage makeover by Loretta Lowbrow using the amazing Cailyn products and vintage hairstyling by Gemma from GSL Makeup! No silver screen siren would be complete without a gorgeous gown, so we will be professionally styling our gorgeous clients in the vintage reproduction Vivien of Holloway frocks from Christine’s. Loretta Lowbrow and I. Loretta did our makeup using Cailyn products and our lovely dresses are both from Christine’s. Loretta wears a Vivien of Holloway ‘Bombshell’ dress and mine is my VIvien of Holloway ‘sarong’ dress. Loretta Lowbrow did her makeup for this photograph using the fabulous Cailyn products. She is wearing her stunning Vivien of Holloway ‘Bombshell’ dress from Christine’s. My makeup here is by the talented Loretta Lowbrow using Cailyn products and again I am wearing my Vivien of Holloway sarong dress from Christine’s. I love this dress! No photo shoot would be complete without photos that you can keep forever, so for this special deal I will be selecting the best two images from the shoot and airbushing and enhancing them to perfection in my digital darkroom on my apple Mac computer. Our clients will then receive a CD containing these. Two will be full resolution and two will be web resolution so that they can be uploaded easily onto facebook or emailed. We have timed these shoots perfectly, so that the photos will be ready and returned before Christmas. Hence, there will be ample time for prints and canvases to be created for the perfect gift to a special someone, whether it be your mother, father, grandparent or partner! I think that together with my partners in crime, we have devised the perfect photo shoot package in time for last minute christmas gifts or just for some well deserved pampering and fun. 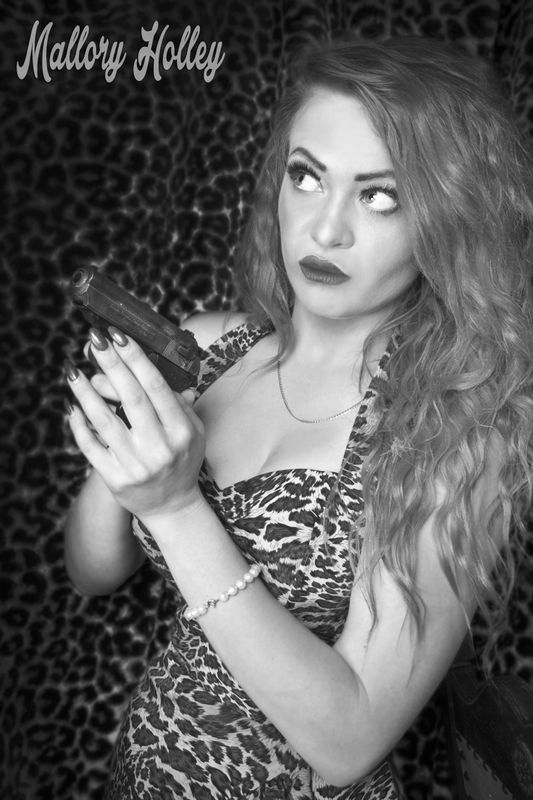 If you are in Victoria and are interested in our Film Noir Christmas Special this Sunday the 7th of December, we still have a couple of places left, so to make your reservation, head on over to: http://malloryholley.pgtb.me/TjrmPM and complete the special from. Once we’ve received it, we’ll give you a call to confirm. This entry was posted in Events, Photo Shoots, Special Offers and tagged 1940s, 1950s, 40s, 50s, 60% off, antique, Ava Gardner, Cailyn, Cailyn makeup, childern, Christine's, christmas gift idea, film noir, glamour, GSL Makeup, Loretta Lowbrow, pampering, photo shoot deal, photo shoots, piano, pinup photo shoot, Rita Hayworth, silver screen siren, special, Victorian piano, vintage hair, vintage makeup, vivien of holloway, Vivien of Holloway Australia. Bookmark the permalink.